The Helios KSUV Knife Sterilizer Cabinet does exactly what it is designed to do. The cabinet has an exclusive non UV filtering knife holder as well as mirrored interior walls to eliminate shadowing on knife surfaces, providing 99% sterilization. The knife holder can accommodate up to 12 knives. There are also two larger slots to accommodate cleavers while still housing 10 knives. The cabinet can be set for as many as 15 minutes, but will clean cutlery in as little as three minutes with 99% effectiveness. In independent laboratory testing there was a 99% reduction in E. coli bacteria. The cabinet has a filtered plexiglass door that protects the operator from UV rays while allowing full view of knives inside (sunglasses are optional). 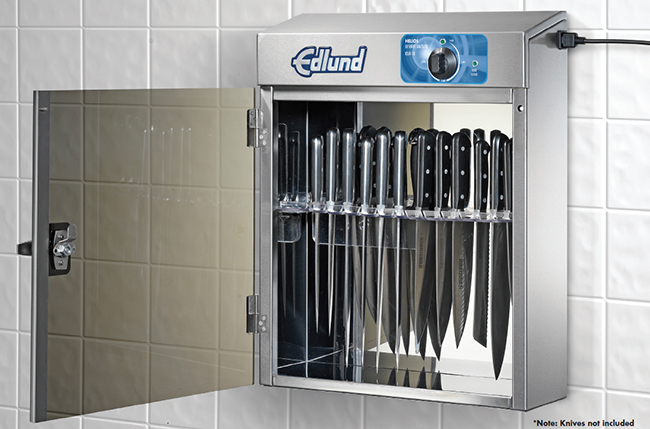 Edlund says it’s like a SPF-99 (Sterilization Protection Factor) for knives. As a safety precaution, when the door is open, the sterilization process cannot be initiated. If the process has already started, it will stop if the door is opened. It also has a keyed lockable handle to provide extra security. Here’s a video demonstration from Edlund.